Fresno State football made history Saturday afternoon after defeating Arizona State in the Las Vegas Bowl. Fans both in the stadium and back at home celebrate the teams victory. LAS VEGAS (KFSN) -- Ronnie Rivers rushed for 212 yards and two touchdowns, Anthoula "Tank" Kelly had a 70-yard interception return for a touchdown and No. 19 Fresno State beat Arizona State 31-20 in the Las Vegas Bowl on Saturday. 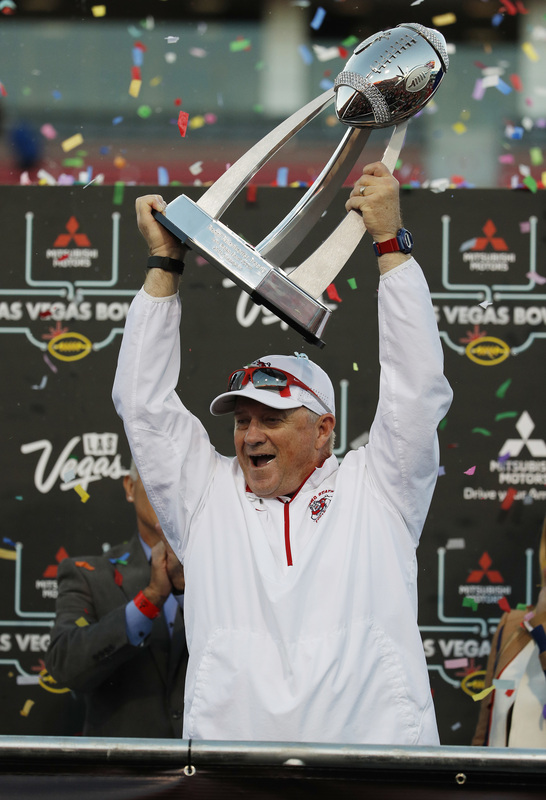 Fresno State head coach Jeff Tedford holds up the trophy after his team defeated Arizona State in the Las Vegas Bowl, Saturday, Dec. 15, 2018, in Las Vegas. Stephen Hicks and Chris Alvarez have your Las Vegas Bowl highlights, where the Fresno State Bulldogs defeated the Arizona State Sun Devils 31-20.